Welcome to our wonderful studio condo in the new Cruz Bay luxury resort, Grande Bay. We have survived Hurricane Irma in good shape and are looking forward to welcoming our St John friends -- old and new -- back to their favorite island. St John has made a remarkable recovery and is more than ready for visitors. Our studio is perfect for a couple, with or without children. The studio has a king bed in the sleeping area and a queen sleeper sofa in the living/sitting area. There is a balcony from which to enjoy the awesome views of the Caribbean and a washer/dryer. There is also a fully equipped stainless steel and granite kitchenette with a refrigerator, sink, microwave, electric Weber grill on the balcony and small electric appliances (coffee maker, blender, toaster/oven, plug-in burner, etc.). We also own the adjoining one bedroom condo (homeaway.com/4955527) which also has a king bed in the master bedroom and a queen sleeper sofa in the living room, which can be connected to the studio to form a large two bedroom or can also be rented as a separate unit. Grande Bay is a 48 unit resort directly on the water and only a three to five minute walk to 'downtown' Cruz Bay with the ferry and all its restaurants, bars and shops. 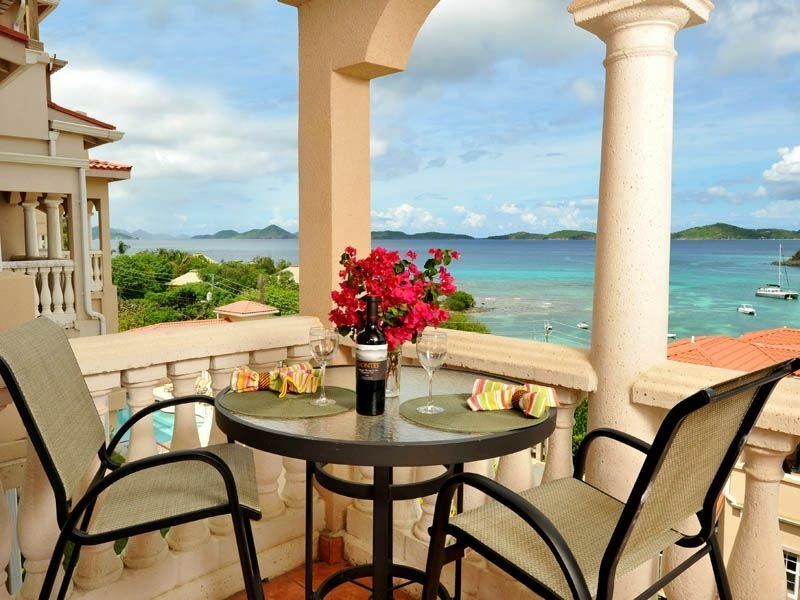 We have spectacular views of the water and harbor with St Thomas in the distance from the balconies. We have a particularly good location within Grande Bay. We are on the second floor (really the third floor, since the ground floor is the garage) of the rear Building C (Stairwell 6) near the pool and away from the town side. We especially like this location because: (1) we are off the street and don't have any street noise and have more privacy; (2) we are up high so we have great panoramic views; and (3) we are away from town so it is quieter (no Beach Bar or nearby construction) Use our apartment as your base to explore the most magnificent island on earth! Our studio comes fully equipped with high end furnishings in the Caribbean style with many personal touches. We offer a Sony flat screen hi-def cable TV with Netflix, and have high speed internet (also, free long distance domestic telephone calls). You can also listen to your favorite music on our stereo, best of all, just sit on the balcony and enjoy the spectacular view. If you check out our reviews, you will get a very good sense of the kind of experience you can expect to have renting from us. Use our apartment as your base to discover the paradise that is St John! You can walk to two of the most beautiful beaches, Solomon and Honeymoon, in 30 minutes along the National Park Service trail through the woods. Or rent a car or take a taxi to explore the North Shore beaches -- some of the very best in the world. In ten minutes you will be at Hawksnest, and then on to Oppenheimer, Trunk Bay, Cinnamon, Francis Bay and beyond, to name a few, all within the protected boundaries of the National Park. You can take your beach towels, chairs and coolers from the unit, so pack a lunch and make it a day. After a day at the beach, come relax pool side or sit in the hot tub and soak in the view. Or if you want to be more vigorous, come work out in our state of the art fitness center with the best views imaginable. We have treadmills, elipticals, bikes, weights, a strength tower, and, yes, even a pilates machine! In the evening, walk to one of the many bars or restaurants in town, or listen to music at the Beach Bar, just two minutes away. Or get some of the best and cheapest barbecue ever from Uncle Joe's and sit on the balcony and watch the sun set as you eat your dinner. So many terrific choices!! But most importantly, just relax and enjoy this very special spot. We are certain that you will love St John and Grande Bay as much as we do -- it would be virtually impossible not to. Betty and I and our three daughters have been coming to St John continuously for well over 20 years. For us, it was love at first sight and we all think of St John as our second home. When the Grande Bay project was announced, we jumped at the chance to own our own place in paradise. Grande Bay is in a wonderful location -- so convenient to town, yet with spectacular water views and close to the wonderful North Shore beaches. Grande Bay has four buildings -- two in front and two in the rear up the hill, above the front buildings. We specifically chose to be in the rear building (Building C) higher up with more expansive views and away from any street noise. We think we have the very best location within the Grande Bay complex, which itself has the best location of any condo development on St John. Our wonderful spacious studio allows a couple with or without children to enjoy the wonders of St John in an elegant and beautifully furnished, yet affordable, condo with a king bed and a queen sleeper sofa. If you check out our reviews you will get a very good sense of what you can expect staying with us. Come visit us! Treadmills, exercise bikes, elipticals and weight equipment all overlooking the Caribbean -- best workout views ever! Come enjoy our exceptional studio! It is truly fully equipped with everything you will need for a wonderful stay and with amazing Caribbean views. Loved this place. As it says...great views. So close yet quiet. Lovely place with everything you could want. Would definitely stay here again. Well-stocked, comfortable, nice decor, comfortable beds- all first class. This location is perfect for enjoying restaurants, bars, shops, beaches. We will be back! This clean, well-appointed unit was ideal for two of us. What a comfortable space with a lovely view from the balcony. The condo was equipped with everything we needed for our stay including great beach chairs, an umbrella and a cooler. Grande Bay Resort is quite convenient for walking to restaurants and shops and the resort amenities (pool, hot tub, fitness center, etc.) enhanced our stay. All communication and service was prompt and professional. We would gladly return to Sugar n Spice. St. John never disappoints - beautiful and a fun time as always! The Sugar N' Spice condo was just perfect for us - so close to everything that St. John has to offer! Condo was very clean and had everything we needed. The view was just amazing from the balcony and showcases the beauty of this island. Great clean unit in a great location. Tom has a really quality unit with super views. The property is very well kept with all the amenities you need to explore fabulously beautiful ST John. Having parking right under you in a garage makes going and coming to beautiful spots so easy. Rachelle the property manager is over the top friendly and thoughtful about all the extra details. This was a prize stay on our family vacation. Thank you Tom and Rachelle! Wonderful location, great views! The studio had everything we needed and was very clean! We have a wonderful heated hot tub and pool as well as a fitness center for our guests with the best views of any fitness center in the Caribbean.